Madness Photography started as an official, serious company in 1998. But the history of Madness Photography started long before. Onno “Berserk” Wieringa, founder and owner of Madness Photography, has been a self-taught photographer since he was a little kid and started to take pictures of something he loved since the day he was born: motorcycles! After he finished high school, he started working for various Harley-Davidson shops, where he learned to work on bikes. At the age of 17, he already owned two Triumph’s and when he was eighteen he had four Triumphs and a Suzuki GT 750. After getting his drivers license, when he was eighteen, the Triumphs all had to go and were replaced by a bike that he had wanted since the day he was born; a Harley-Davidson. This bike is still in his life; it’s an FXE-F 1200 Super Glide Fat Bob, which has been rebuild and modified endlessly and ridden for many miles. Going everywhere on the bike, there was one thing he always had in his pocket; his camera! At the age of 23 he started drag racing, and he and his team named “Midnight Madness”, raced the bike on all the major races and drag strips all over Europe. He has competed in many classes; starting with the Street bikes, than Ultimate Street Bike, Super Stock, Pro-Stock, and then finally in the fastest gas burning class; Top Gas! Also again taking thousands of photo’s of everything interesting, at every racetrack! Being a racer for more than 18 years gave him insight in the world of fast bikes, and he’s still involved in the world of drag racing as a helper/mechanic and of course photographer / reporter. Vance & Hines has developed a brand-new edition of their Fuel Pak, called the FP3, which will be ready to hit the market in March 2014. It is plug & play and loaded with more and better options than ever before for late model Harley owners. The FP3 will fit 11-14 Softail, 12-14 Dyna, 2014 Tourings and 2014 Sportsters. A must-have for those contemplating an exhaust or air cleaner change, but even with a bone stock bike remarkable results can be expected. Communication with your bikes fuel injection system is done via bluetooth with your smartphone, either Android or iPhone. Flash technology is used to recalibrate the fuel map. Stationary manual adjustments will let you adjust the fuel map, EITMS (Engine Idle Temperature Management System) and idle speed, AFR (Air Fuel Ratio) can be set slightly richer or leaner. Ignition timing can be adjusted and includes a rev limiter. New maps can be downloaded from Vance & Hines and through the on-bike sensors the system can be run in AutoTune mode, which enables the bike to recalibrate the fuel map real time to the specific conditions and even quality of fuel that is used. When the Android or iPhone is installed on the bike, live sensor data, like speed, RPM, cylinder head temperature, voltage, gear selection etc. can be seen on the display of the smartphone. Obviously, once the FP3 is used on a bike it is ‘mated’ to that specific ECU. You will not be able to use the same FP3 for tuning another bike. If you’re ready to dial-in to perfection you can call your Motorcycle Storehouse dealer and ask for MCS 981958. 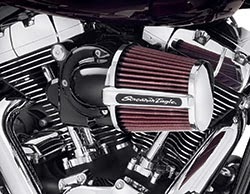 MILWAUKEE - Open up the performance of a 2014 Harley-Davidson® Touring motorcycle with the new Screamin' Eagle® Heavy Breather Elite Performance Air Cleaner Kit (P/N 29400173 Chrome, P/N 29400172 Gloss Black; $399.95) from Harley-Davidson® Genuine Motor Parts and Accessories. This high-performance air cleaner features a forward-facing, washable and re-chargeable filter element that flows huge volumes of clean air. The intake tube mounts to a custom back plate with integral breathers, and covers the throttle body and electronics for a finished look. The low-profile cast elbow and the oval cross-section element hug the engine to provide increased leg room. 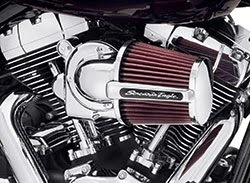 The Heavy Breather Elite is available in Chrome or Gloss Black finish to match any styling direction, each finished with bright chrome end caps and trim with Screamin’ Eagle® script. The kit includes filter, intake tube, custom back plate, water-repellent rain sock and all mounting hardware. This intake fits 2014 Touring models except those equipped with a Twin-Cooled™ engine, fairing lower glove boxes or fairing lower speakers, and is street legal when used with an Original Equipment throttle body. Proper installation requires ECM recalibration by an authorized Harley-Davidson® dealer (priced separately). 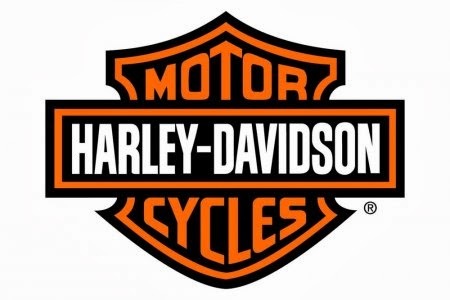 Harley-Davidson Motor Company produces custom, cruiser and touring motorcycles and offers a complete line of Harley-Davidson® motorcycle parts, accessories, riding gear and apparel, and general merchandise. For more information, visit Harley-Davidson's website at H-D.com.